These days during Holy Mass, we’re listening to the story of the Macabees – the brave and committed People of God who heroically defied the Seleucids by refusing to worship their false idols. They paid dearly for it, including torture and murder. The Gospels have included parallel stories of defiance or consequence of idol worship. 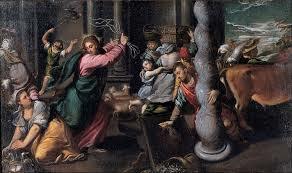 In today’s Gospel, Jesus cleanses the Temple of the money changers and profiteers. Pope Francis spoke about this at his morning Mass in the Casa Santa Marta chapel. “Jesus did not chase the priests and scribes away from the Temple; he chased away those who were doing business there, the businessmen of the Temple. The chief priests and scribes were involved in their dealings: this is ‘holy bribery’! The Gospel is very clear. It says ‘The chief priests and scribes wanted to kill Jesus, along with the elders of the people’. The same thing happened under the rule of Judas Maccabeus. Why? Because ‘they did not know what they were doing, since everyone hung on his every word’. Jesus’ strength is to be found in his words, in his love. And where Jesus is, there is no room for worldliness. There is no room for corruption! This is a challenge for each and every one of us; this is the struggle the Church has to face every day. We must always heed Jesus’ words; we must never seek comfort from another master. Jesus told us that we cannot serve two masters. God or riches; God or power”. At the conclusion of his homily, Pope Francis said, “We ought to pray for the Church. We must hold in our hearts today’s martyrs, who suffer and die, so as not to be ensnared by worldly desires, by obsession, by apostasy. Today! Today, there are more martyrs of the Church than there ever were before. Let’s think about that. It does us good to think about them. And also to pray that we may never fall into the trap of worldliness, where we will be obsessed only by money and power”. Let’s implore our Lord Jesus for the sake of persecuted Christians throughout the world. Let’s also implore his strength and grace for ourselves and our loved ones in the face of trial and temptation. Macabees, Pope Francis, Worldliness. Bookmark.